Beginners Guide: Is Cesky Krumlov Worth Visiting? Hm, is Cesky Krumlov Worth Visiting? Central Europe has many small towns that make you feel as if you’ve departed from “the real world” and fallen into a fairy tale. It’s easy to feel overwhelmed at the sheer number of options at your fingertips. If you have a limited amount of time, you may be wondering which towns are worth squeezing into your itinerary. Um. YES. Yes, it is worth visiting. Cesky Krumlov was one of my favorite small towns that I visited on my trip to Central Europe. I fell in love with the castle, went on a cool rafting trip, and actually went on a small hike alone – which is hella impressive for someone who hates hiking! This beautiful town, nestled in the Czech Republic, looks like it was torn out of an illustrated edition of Brothers Grimm. Tiny homes, cobblestone streets, evocative town squares, and an assortment of churches, independent hotels, and shops are all charming and adorable, for sure; however it’s important to note Cesky Krumlov is not a hidden gem. Sorry, I’ve seen Cesky Krumlov on many “hidden gems of Europe” lists. Too many, actually. I hate to be the bringer of bad news, wayfarers, but Cesky Krumlov is smack on the tourist trail. But who really cares, right? This place reminds me of Hyrule, for god’s sake! It makes plenty of sense people, myself included, would want to spend time holidaying here. You can even spend one day in Cesky Krumlov and have a magnificent time. So book your stay and enjoy my Cesky Krumlov Guide! Still not Convinced Cesky Krumlov is Worth it? Okay, so you’ve arrived in Cesky Krumlov, you lucky person you. What do you do next? The Cesky Krumlov Castle is the main tourist attraction and a good place for you to begin exploring. I didn’t go into the castle itself, but my camera snapped some spectacular views after climbing to the site’s peak. Be warned: to take the best pictures, do the castle climb early in the day or later in the afternoon (think after 4). Why? Because day trippers clog this beautiful town especially around the castle. Once they retreat back to their tour buses, Cesky Krumlov offers far more authentic magic which is reserved for overnight visitors. I especially enjoyed the views at night. The atmosphere is incredibly peaceful. Quiet cobblestone streets, yellow lights aglow in historic buildings, the smell of pork and beer wafting in the air, believe me, exploring at night and looking up at the view of Cesky Krumlov Castle is absolute perfection. In addition, don’t miss the castle’s free gardens! They’re not as spectacular as the gardens at Versailles or Schonbrun, but the flowers and fountains are still quite pretty and hey, they’re all free. Walk around and take some cute pictures. Now let’s theoretically say you’re burnt out from the typical European sightseeing routine. You know what I mean: an obligatory visit to the church, town square, and museum. You don’t feel like trekking around the castle grounds, because quite frankly, all the castles have blurred together and you don’t care if you miss another one. Well. Here’s some good news… Cesky Krumlov offers a super unique activity, one that was a major highlight of my trip, one I still brag about years later. In Cesky Krumlov, you can participate in a rafting pub crawl! Yes, I promise you correctly read that sentence. The Vltava River cuts through the town of Cesky Krumlov. Many companies will rent canoes or rafts, so you can effectively explore the Czech countryside, stopping at pubs, campsites, and small towns on the river’s bank. Make sure to check TripAdvisor for reviews and prices. Furthermore please be aware that 99% of the time, these rafting tours are entirely self-guided. Meaning you need to be responsible for your own actions (ugh, I’m using my teacher voice). So don’t act stupid on the water! My raft mates were calm and talented rowers, but I saw quite a few tipsy tourists capsize into the Vltava when they sped too fast into the rapids. Not fun. By the time you return, still exhilarated from your river adventure, the town should be quiet and serene for dinner. The riverbank offers so many surprises, and you can even customize the length of you trip. It may take four or five hours to reach certain destinations. Most rental companies allow you to bring food and drinks onto the raft, as well as offer a dry bag to safely store your electronic equipment. On my own visit, I participated in the rafting pub crawl on a complete whim, but if I returned to Cesky Krumlov, I’d research the stops in a bit more detail and take a longer trip down the river. I’m not a rafter, yet I could’ve stayed on the river longer than an afternoon. Honestly, whichever campsites and/or pubs you decide to visit, expect to enjoy your trip for at least two hours. Longer journeys work into your favor. Why? Book your accommodation in Cesky Krumlov. This is the historic center of quaint Cesky Krumlov. Colorful houses surround you on all sides. Again, you feel as if you’ve transformed into a Zelda Ocarina of Time character. Take your time on a sunny afternoon to sit in the square and enjoy a coffee. Cesky Krumlov is a town where you’re meant to soak up the atmosphere rather than run from site to site. So slow down! Now … a fair warning, this square does get packed in the middle of the day. Lots of tourists coming from Prague and other areas of the country like to congregate here and take pictures. And can you blame them at all? Nonetheless, you want to time your visit in order to enjoy the essence of Svornosti Square. Try to see this place before or after the day trippers depart for other pastures. Arrive Later in the day to see the magic of Cesky Krumlov! I want to reiterate: Make sure to wander around the charming Cesky Krumlov streets after four in the afternoon. As I’ve already said earlier in the post, Cesky Krumlov isn’t off the beaten path itself. The charms spill into the quiet streets after most of the selfie-stick totting tourists have hopped on their day coach and left. Rafting gives you an adventure for the busiest times of the day, and then allows you to return when Cesky Krumlov is less packed with mobs of day trippers, blocking the small streets and snapping photos each time they walk five inches in a new direction. Trust me, you’ll be shocked at the difference in the town’s vibe once all the day trippers depart. It’s perfect. Cesky Krumlov also has some hiking opportunities right outside of town. Personally, I’m not a hiker. Take a look at my pictures. Do I look like a skilled hiker to you? Heck, no! Anyway, shorter hikes. For example, I took a 20 minute hike from my hostel to check out an abandoned church, which overlooked the town. Okay, it was more of a walk than a legitimate hike, but pssh, semantics. You have many accommodation options for when you’re seeing Cesky Krumlov in one day. As a solo traveler, I stayed in Krumlov House & Writeaway Retreat, and I absolutely loved it! It’s a small hostel with a comfortable kitchen and living room. The staff will also help you book your amazing and tipsy rafting pub crawl, haha. However, Cesky Krumlov also has hotels and bnbs if hosteling is not your style. Make sure to book in advance during high season or the months of July and August. Do you think Cesky Krumlov is worth visiting? What are your favorite small towns in Europe? Why do you love them? Do you think visiting smaller towns is more rewarding than checking out the big cities? If you’re visiting the Czech Republic, be sure to check out the most recent Lonely Planet guide book. Some links are affiliate links. I will make a small commission at no additional cost to you. « Blond Wayfarer is Visiting Iceland!! Hi! I just saw this! I’m not a graphics teacher, haha. All self-taught! I just didn’t want to leave… is soooo beautiful!!! One of the best places I’ve ever been. 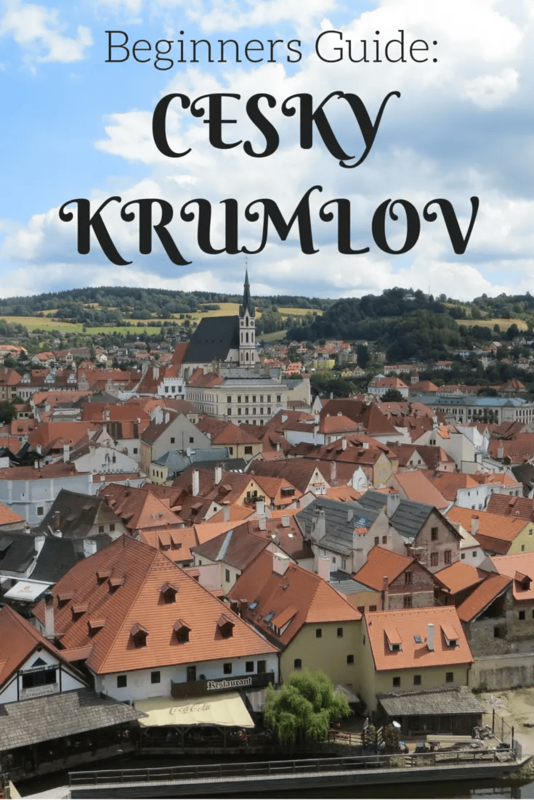 So I am heading to Cesky Krumlov tomorrow and found this post very helpful! However I already know that I need to go back in order to do the rafting pub crawl! How fun!